Martin, Heather, Justin, Cindy and I investigate the cheese of the 1975 Godzilla farewell flick, Terror of Mechagodzilla! Some days you eat the bar and some days the bar eats you, right? I know, I know… It’s actually supposed to be “bear”, but I’m making a Lebowski reference! But you don’t care about all that, all you need to know is that despite the wrestling with my audio this weekend, the new episode (#28) is now online and ready to fill your needs for giant monster talk. This is the Daikaiju Discussion episode for Terror Of Mechagodzilla and I had the distinct pleasure of watching the film and then discussing the film with previous guests Cindy Okumoto, Martin Vavra, Heather Brask and Justin Turner (yay!). And if you turned in your homework (aka submitted your thoughts on the film), they have been included. 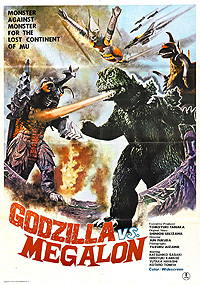 Next month’s homework assignment is to watch the splendiferous 1973 Jun Fukuda giant monster super battle film, GODZILLA VS MEGALON! I know a few of you listeners love this film and I fully expect to hear back from you about this. Basically, we’ll be watching a subtitled version in an attempt to class it up as much as possible (unless I break down and get the Australian release), but since this movie isn’t super-avaialble in the US, watch what you can – whether you pop in an old VHS tape or the laserdisc or if you have to watch (*gasp*) an illegitimate version of the film. I hope to get as many submissions as we did for the ’75 Godzilla film. Just make sure you get your thoughts, questions and reviews in by the last week of the month. 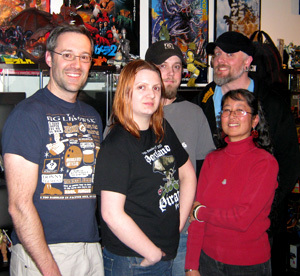 Next month’s show will have a couple of small interviews from the show we are hitting this upcoming weekend, Emerald City Comicon! So keep an eye out for that. If you’d like to request a Godzilla-themed song, send an email to controller@kaijucast.com and I’ll see what I can do. If you are one of those folks that downloads the show to your computer, you can do that by following this link. Otherwise, I hope you guys enjoy this episode and continue to enjoy the bi-monthly format. See you in a few weeks with the Emerald City show!